I have a confession to make… Growing up, I ate canned soup. As in, I think that may have been the ONLY kind of soup I ate. Once my brothers and I got set in our ways when it came to food and we found something we liked, there was no straying from that. In fact, we still get picked on for eating bean and bacon soup. My oldest brother still eats it to this day, and his old roommate’s wife still talks about how he used to make it all the time. One time though, my mom pureed the bean soup, and I loved it even more. The thickened soup with all those flavors, minus the chunks of beans? Dee. Lish. 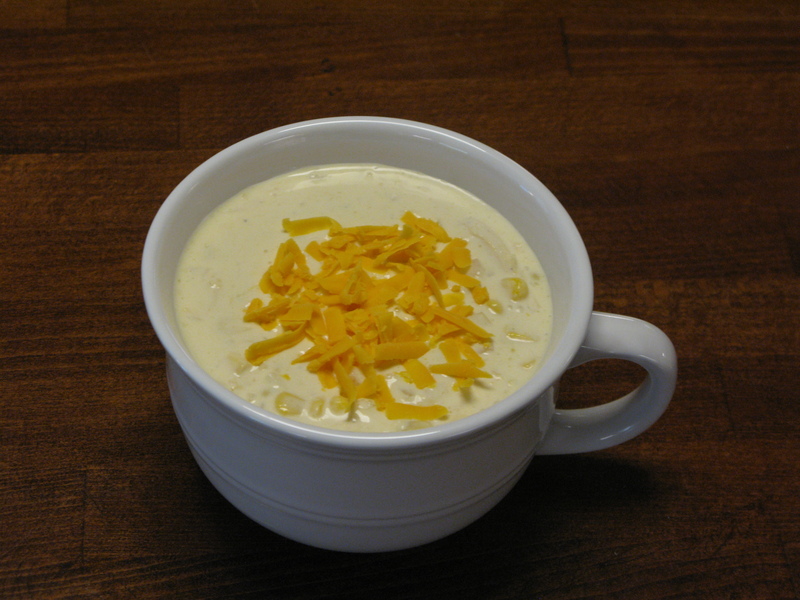 A few years ago (before I really got into cooking), my husband found a recipe for chicken and corn chowder, and made it for us. Oh…my…gosh. I asked him when he was making it again, because I absolutely could not get enough of it. After taking the Stocks, Sauces, and Soups class in culinary school last month, the thought of making some of those amazing soups we had has been lingering in my brain…so I made this. My husband couldn’t find the original recipe that he made, so I put this together. I ate this for lunch and dinner yesterday, and although my belly was full, my brain wanted more. Melt the butter in a large pot over medium heat. Add onion, cook until soft. Stir in the flour, and cook for about 3 minutes. Slowly whisk in the chicken broth, making sure everything dissolves together. Add potatoes, cook for 15-20 minutes (or until potatoes are tender). When potatoes are done cooking, add heavy cream, corn, and chicken. Cook until heated through, add parmesan, salt, basil, and pepper. Continue cooking until cheese is melted and soup is hot. Garnish with freshly grated cheddar, bacon bits and green onions.